Last spring, Lil’Jordan Humphrey set up what would be a successful fall with a seven-catch, 100-yard performance in the Orange-White spring game. Fast forward a year and Humphrey was again a storyline at Saturday night’s spring game, even though he ran as many routes as Ludacris. This year’s scrimmage was instead a case study for what the UT offense will look like without Humphrey, who has declared for the NFL draft. As UT’s “H” receiver in 2018, Humphrey led the Longhorns in receptions (86), receiving yards (1,176) and touchdown catches (nine). Sophomore Joshua Moore ran the majority of the H routes for UT’s first-string offense on Saturday. Freshman Bru McCoy also got a first-half series at the position. Running back Jordan Whittington, who is Moore’s cousin, ran a play out of the slot. Redshirt sophomore Jordan Pouncey was the primary H receiver for the second team. Targeted four times, Moore had two catches and 9 yards. Pouncey hauled in half of his eight targets. Both Moore and Pouncey had at least one noticeable drop. “I feel like we’ve got some options there,” Herman said. In addition to the aforementioned receivers, Texas has also signed four-star receiver Jake Smith. Work in progress: When asked about his second-string offensive line, Herman said some work still needs to be done. “We’ve got to accelerate that pretty quickly here,” Herman said. He said the backup linemen have potential but need to slow the game down and get better at thinking on their feet. At one point during the first half, backup center Rafiti Ghirmai had three bad snaps in a four-play series on the goal line. White team quarterback Casey Thompson recovered one of those wayward snaps and turned the play into the night’s only touchdown. Ghirmai was recruited as a tackle, but the redshirt freshman is learning a new position this spring. In each of the past three seasons, Shackelford has missed playing time due to various injuries. In addition to Ghirmai, junior Derek Kerstetter also has experience at the center spot. Kerstetter is projected to be a starting guard this fall. Injury update: Texas sophomore Anthony Cook was a late scratch for the scrimmage with a hamstring injury. 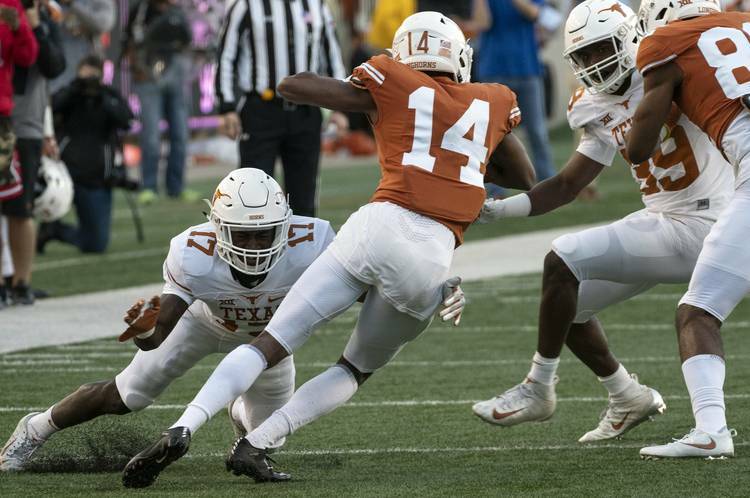 Cook, whose ailing hamstring cost him missed practice time earlier this spring, is among the candidates for UT’s two open cornerback positions. Last season, Cook started once and compiled 18 tackles and a pass breakup. … Wide receiver Collin Johnson (knee) and Josh Thompson (head) also missed the scrimmage. Safeties Brandon Jones (ankle) and Caden Sterns (knee) and linebacker De’Gabriel Floyd (neck) had previously been ruled out. Texas football coach said incoming freshman running back Derrian Brown was unable to make the spring game, but they are still optimistic about his progress.